-> Here you can find videos of most of the talks, slides from some of the talks and all abstracts. -> Here is a YouTube playlist of all recorded talks. -> Here we added a list of all participants. If you participated and want a link to your personal homepage write us a short mail. ​-> Here you can find a live-blog by Ulrik Buchholtz, following the talks at the FOMUS meeting (Facebook login required). The FOMUS workshop was held at the Center for Interdisciplinary Research of Bielefeld University from the 18th to the 23rd of July. Within this framework approximately 80 graduate students, junior researchers and leading experts gathered in order to investigate and discuss suitable foundations for mathematics and their qualifying criteria, with an emphasis on HoTT/Univalent Foundations and set theory. This interdisciplinary workshop, designed as a hybrid between summer school and research conference, was aimed at students and researchers from the fields of mathematics, philosophy and computer science. 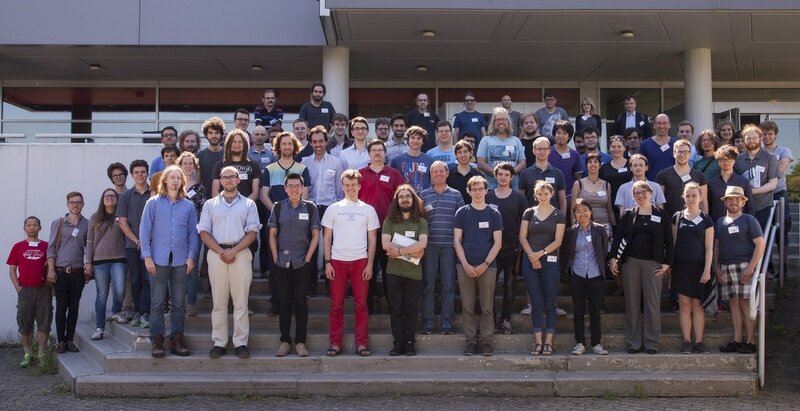 The workshop was opened with an introduction to these two different foundational theories, with an emphasis on the less popular homotopy type theory, and then progressed into indepth panel discussions and (research) talks. With regard to the philosophical discipline of mathematics, the formal requirements of the foundations of mathematics, their limitations and their naturality were examined. Recently, it has become increasingly important to formalise mathematics by computer-aided formal proof systems, such as Coq. With this in mind, it was investigated which foundation is most suitable for the changing needs of mathematical practice. ​The poster for the workshop can be downloaded here. This workshop was organised with the generous support of the Association for Symbolic Logic (ASL), the Association of German Mathematicians (DMV), the Berlin Mathematical School (BMS), the Center of Interdisciplinary Research (ZiF), the Deutsche Vereinigung für Mathematische Logik und für Grundlagenforschung der Exakten Wissenschaften (DVMLG), the German Academic Merit Foundation (Stipendiaten machen Programm), the Fachbereich Grundlagen der Informatik of the German Informatics Society (GI) and the German Society for Analytic Philosophy (GAP).